I recently received my first ring made of Tungsten and it's true you can't scratch this metal. I am just learning about this.. I took a sharp knife to it and couldn't damage it. It's heavy though. I guess they use it in D2 Tool steel acting as a grain refiner. If you want to know more just google in Tunsten I like the Wikipedia one..
Rindy, I just now saw the video and hate to say it but I laughed my head off. That 44.95 price should have been the first indicator that thing was no good. And he said it was for practice? I can hear the lawyers sharpening their pencils across the country. We just started fighting in the style that the Association for Renaissance Martial Arts (ARMA) uses. Here is a website with videos if you are interested. I never thought I would enjoy using anything larger than a foil but I've really been having a grand time learning all the new stuff. Roberto are you still practacing your sword fighting? I am so mad. I have had my claymore hanging on two brass hooks.. well went to pick it up and it is scratched all to heck makes me so upset. I should of wrapped it with leather long ago. How do you folks hang your swords? Just wanted to say that a good friend of mine, of Clann An Drumma makes wonderful swords and daggers in his spare time. You can see some of them he's made on the site listed below. I have a dagger he made out of copper that is really beautiful. It has a celtic cross on the handle. Has anyone purchased or made any new swords or daggers recently? I am starting to really get the urge to buy a targe why I have no clue. Hi jime307 Is this the one you were looking for? 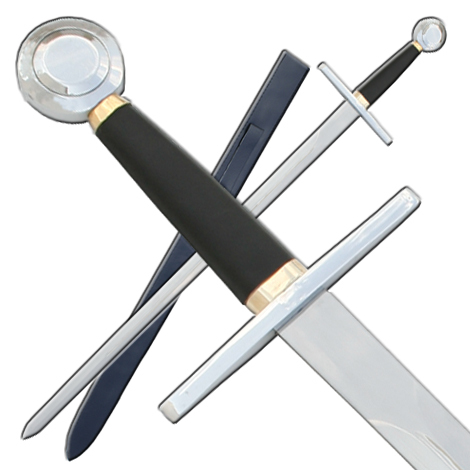 Click on the links page and then Kirkpatrick Swords. I have the copper celtic cross dagger and its so neat. All are one of a kind as they are hand made and he does wonderful work-just drop him a email. I hope this helps. I hope you get one. Let me know. I will post this post/link in the Arms and Armor thread so I don't lose track of it. I love your dirk. What did you use for wood on that? These were sometimes referred to as "dudgeon daggers" as their hilts were made of dudgeon (boxwood), as is mine. 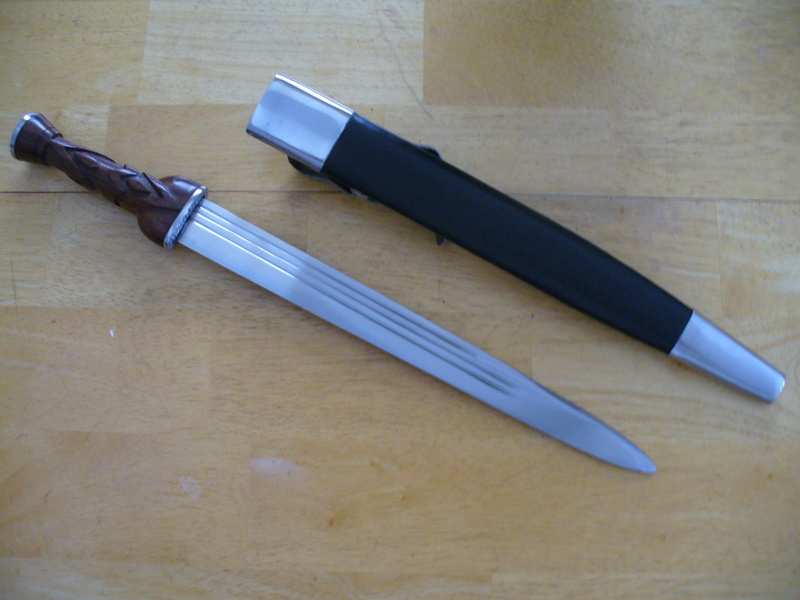 Has anyone purchased or made any new swords or daggers recently? Here's my latest creation, a Lochaber axe. The distinguishing feature of a Lochaber axe (as opposed to a Jedburgh axe, bill, or glaive) is the hook opposite the blade. Scotland was a feudal society, and battles were drawn up according to wealth and class. In the front rank would be the gentlemen, who could afford swords and firearms. The second ranks would be made up of freeholders, often armed with less expensive weapons like pikes and Lochaber axes and battlefield pick-ups. The rear ranks were made up of essentially serfs, armed only with scythes, threshing flails, and hayforks. When faced with cavalry, unlike a shield wall or massive infantry square, the Highland Scots would break up into smaller formations called schiltrons, with the pikes and axes to the fore. The cavalry, unable to attack the schiltron's pikes from the front, would do what cavalry does best; maneuver; race between the schiltrons trying to outflank them. As they rode between the schiltrons, the axemen would reach out with the hooks of their Lochaber axes and suddenly convert the horsemen into footsoldiers. Besides the obvious cutting edge, in use the base of the blade could be used to hook inside a swordsman's guard, and the point could penetrate chain mail. The base of the haft was often sharpened or mounted with an iron point as well, making a very versatile weapon with which a crofter could attack and defend against an armored professional soldier at much greater than arm's length. The dirk I have the Celtic Cross one isn't wood it's a resin. The copper runs up underneath it. Kind of hard to explain but if you have more questions I'm sure the man that made it would be happy to answer them for you. Thanks for sharing this Emmet! I noticed my claymore is rusting in a few spots. Anyone have any recommendations on what to use. I have steel wooled it and put a small amount of turbine oil on it. Any help would be appreciated. Are you keeping it in the sheath or is it being displayed without? I have a couple steel blades and my home is fairly humid so I keep them in the sheath with a drop or 2 of oil spilt inside to aid a quicker draw and to keep off the rust. Try these sites the first is better than the second but I found the second humorous so I threw it in anyway. Hi McRoach, no it doesn't have a sheath as it's battle ready. Thank you for these sites. I will definetly keep them oiled up. Where I live is pretty dry. I was shocked it had rust. It's hard to polish because it's so sharp one miss and your hand or fingers are gone. Next time I don't think I will get one battle ready. Haves anyone bought any new arms or armour? I am looking to pick up a medieval hand and a half sword if I can find a good deal on one sometime this winter. I posted it under the Swords Forum looking for feedback and no one has replied yet. Hi Rindy, just wated to show off my 16th century dirk. My son gave it to me for christmas last year and I wear every time I get a piping gig. I'm not so much into the medieval arts as my son is. He belongs to a guild in Toronto and has several swords and bucklers. He is working on making his own armor and with any luck I will have his helm ready to give to him this christmas. piobmhorpiper that's a nice looking dirk. That's wonderful about your son working on his own armor. Would love to see it when he's done. Thanks Rindy, I'll be sure to post a picture when it's done.